On Tuesday, May 24th, the Ella Brennan Award Dinner & Auction, the Ella Brennan Lifetime Achievement in Hospitality Award will be awarded to famed Louisiana chef Paul Prudhomme. On Wednesday, May 25th, incredible wine dinners take place in many of the city's finest dining establishments. Reservations must be made well in advance with the restaurants themselves. These sell out, so reserve NOW! On Thursday the 26th, the afternoon features the Vinola Tasting in Harrah's Casino. This tasting includes the finest of the wines available at NOWFE. It also sells out, so if you're interested, sign up NOW! Thursday evening, the Royal Street Stroll takes advantage of New Orleans's unique open-container laws to combine wine-tasting with the open air of Royal Street, as well as its antique stores, art galleries, and live music. On Friday and Saturday (the 27th and 28th), fascinating seminars take place throughout the day. However, the highlight of the NOWFE is surely the two Grand Tastings. 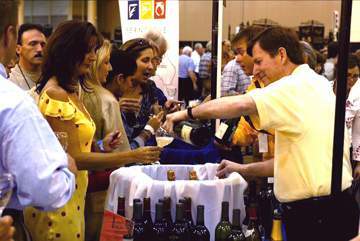 The Friday Grand Tasting is from 6:00 p.m. until 9:00 p.m., and the Saturday Grand Tasting is from 2:00 p.m. until 5:00 p.m. The Grand Tastings feature wines from 175 wineries and food samples from 75 chefs. There's far more wine and food to try than can possibly be sampled in three hours, so if you can afford it, we here at LaWineClub.com highly recommend attending both tastings. Some restaurants only participate on one of the two days, and this gives you the opportunity to try more of them, as well as making it possible to try more than 10% of the wines being poured. If you still have any room left (and are sober enough) after Saturday's Grand Tasting, there is an additional event you can sign up for--COCHON 555 featuring Five Chefs & Five Pigs. This pig-based competition sponsored by Cochon challenges 5 chefs to build a menu using 5 heritage pigs from nose to tail. Soo-wee! Try not to let this incredible wine celebration pass you by without taking part in at least one event. It will be very much worth it. All events require tickets and/or reservations. All profits go to local charity groups, which have included in the past the University of New Orleans School of Hotel, Restaurant, & Tourism; the Louisiana Restaurant Association Education Foundation?s ProStart Program; The Chef John Folse Culinary Institute; Delgado Community College Culinary Arts Program; New Orleans Center for the Creative Arts Culinary Arts Program; Girls First; Cancer Crusaders; Southern Animal Foundation; Coach Sean Payton?s Play It Forward Foundation; and Fore! Kids Foundation.